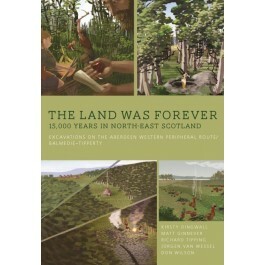 Eight sites were excavated along the route of the Aberdeen Western Peripheral Route between Balmedy to Tipperty. The sites are mostly multi-period. One site on the banks of the River Dee, revealed nine phases of activity extending from the Upper Palaeolithic through to the post-Medieval. Extensive specialist analysis has been undertaken on all sites, along with a programme of radiocarbon dating, OSL dating and Bayesian analysis. During the excavations, it was apparent how the specific landscape of each site was key to the activities taking place there, the periods and duration of activity and the extent to which people were passing through or settling. This was chosen as the overarching theme for analysis and publication, and the geological and topographical background is woven through the presentation of each site. Broadly speaking, the landscape ‘units’ identified were the River Dee valley, the Dee-Don uplands, a second upland zone around one specific site, the River Don valley, and the coastal plains. In addition to the individual site- evidence, a concluding chapter expands on three themes highlighted through the work; Mobility (looking at the temporary/permanent nature of interaction), ‘Gaps’ (periods of time or parts of the landscape which seem unexpectedly blank and the reasons for this), and Methodologies (looking at the specific methods used to identify, test and excavate the sites and consider learnings for future linear projects). Full versions of all specialist reports, the original assessment reports and relevant catalogues are provided digitally through ADS and cross-referenced throughout the text.